It was midmorning on Saturday that we realized there was nothing in the house for lunch. Well, apart from peanut butter and sardines. So I volunteered to trot down the hill to the co-op and see what looked edible. It was snowing, but not too hard, and it’s not a bad walk as long as I don’t try to carry anything too heavy back up the hill. So I peeked into the meat case and saw these gorgeous dry-pack sea scallops – they were enormous and very fresh, so I snagged a package. Then, on my way to cruise the cheese case, my eye was caught by a pack of prosciutto. Lunch seemed to be taking shape rapidly. 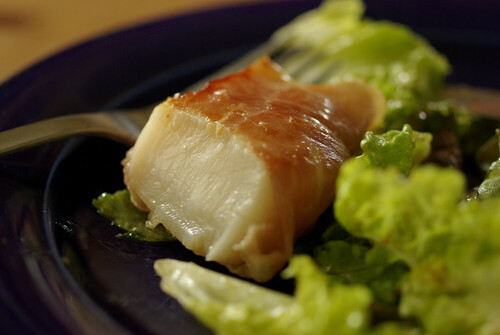 When I checked out, the cashier commented that I was the second person that morning who was obviously going to be having prosciutto-wrapped scallops, based on the groceries that had passed down her belt. Great minds think alike? 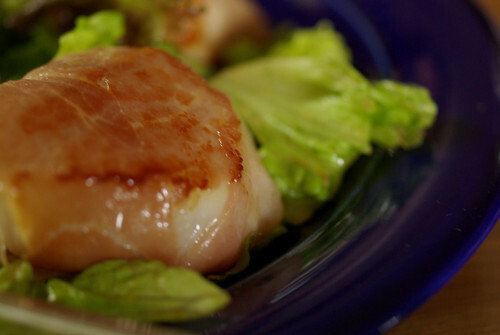 When I got home, I patted the scallops dry and pulled the muscle off, then wrapped a single sheet of prosciutto around each one. Unlike bacon, it clung to itself beautifully and didn’t need to be pinned in place. 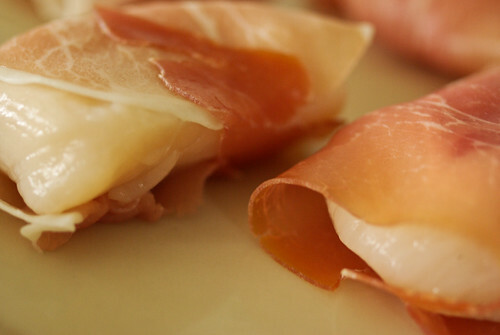 I tossed them into a nonstick skillet and seared until the prosciutto was crispy, just a minute or two. 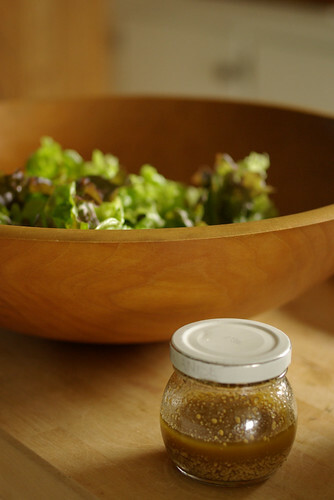 We had some leftover redleaf lettuce from a previous night, and I shook up a dressing of olive oil, balsamic vinegar and mustard, then tossed it all up well and plated the salad. The hot scallops went on top. Quick, delicious and festive for lunch on a snowy March day.